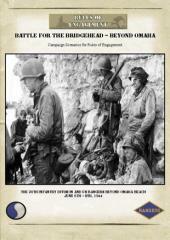 The Beyond Omaha campaign follows the first hours and days of the 2nd and 5th Ranger Battalion's and 29th Infantry Division's combat experience during the invasion of Normandy. The PDF presents 9 scenarios that can be played alone or as part of two interlinking campaigns: Rudder's Rangers and Blue & Gray, each scenario gives a detailed separate brief for both the Axis and Allied players. The PDF is 58 pages long.